This article is a short summary of Mario Calculator. 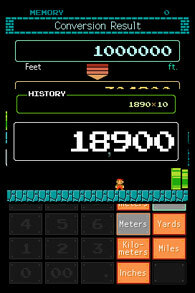 A screen shot of Mario Calculator. Mario Calculator is a calculator application released for the DSiWare service in 2009. It most regions the game was released alongside the companion application, Mario Clock. This page was last edited on 23 September 2016, at 19:38.